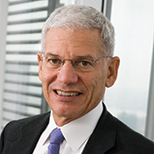 Robert Litterman is the Chairman of the Risk Committee and of the Academic Advisory Board at Kepos Capital. Prior to joining Kepos Capital in 2010, he enjoyed a 23-year career at Goldman, Sachs & Co., where in 1994 he was named partner and became head of the firm-wide risk function. While at Goldman, he also spent six years as one of three external advisors to Singapore’s Government Investment Corporation and researched and published a number of groundbreaking papers in asset allocation and risk management. He is the co-developer of the Black-Litterman Global Asset Allocation Model, a key tool in investment management, and has co-authored books including The Practice of Risk Management and Modern Investment Management: An Equilibrium Approach. He earned a Ph.D. in Economics from the University of Minnesota and a B.S. in Human Biology from Stanford University. He is also the inaugural recipient of the S. Donald Sussman Fellowship at MIT's Sloan School of Management and serves on a number of boards, including Commonfund, the Sloan Foundation and World Wildlife Fund.